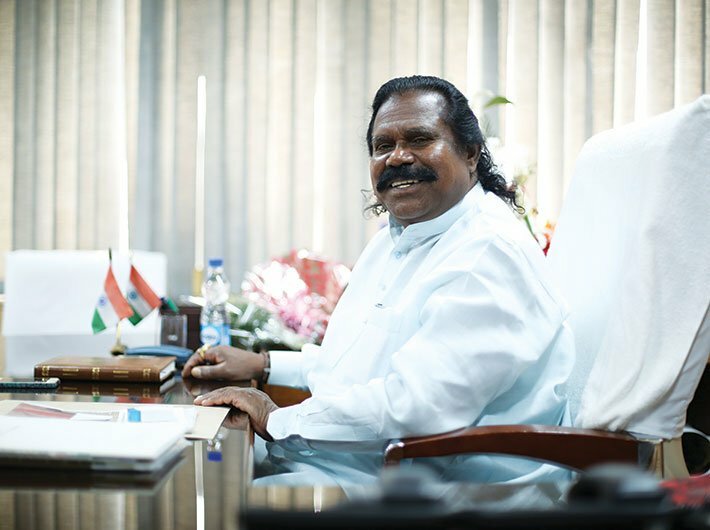 Seasoned BJP parliamentarian Nand Kumar Sai, who took charge as the chairperson of the National Commission for Scheduled Tribes (NCST) on February 28, has his work cut out for him. Archana Mishra caught up with Sai, 71, on his first day in office where he spoke at length on a host of issues being faced by tribals. Sai, who was thrice elected to the Lok Sabha and twice to the Rajya Sabha, says tribals are not getting their reasonable share in government jobs and he intends to set that right. At least 10.4 crore people who fall in the scheduled tribe category are now banking on him. What are the issues that you will focus upon? Before joining the commission, I had worked a lot in tribal areas. The general notion about tribal people is that they are restricted to jungles. But there were tribals who made immense contribution to the freedom movement and sacrificed their lives. Unfortunately, we don’t have any record of their contribution. When I worked as a social activist and also a party worker in the tribal belt, we gathered information related to tribal leaders whose glory faded with time. Birsa Munda, Tilka Manjhi, Veer Budhu Bhagat, Veer Narayan Singh, Raghunath Shah, Sidhu Kanhu and many others are unknown to people. We don’t even know about their family. As the chairperson of the commission, I will form a committee that will research, collect information and prepare a report on popular tribal leaders. Second, to address extreme social and economic backwardness, it is crucial to promote education in tribal dominated states. They have lagged far behind in development. We have to make them aware of their rights and for this we have to prove their eligibility. It is possible only through education. In 1977, I entered politics and since then I have been making concerted efforts to promote primary education in the tribal belt. For once, construction of road can be stopped, but basic education has to be imparted. It’s not tribals alone; others too are equally affected by poor quality of education. Through this commission, we will push the state and the central government to strengthen primary education in the tribal areas. You belong to Chhattisgarh. How do you plan to address the issues of tribals and human rights violations in the state? People are unhappy in the state. Cases of police atrocities have reached the supreme court. We have to understand why the situation is becoming deplorable. The government will have to give answers for the poor law and order in the state. The commission will speak to the state government. Above all, the issues are now to be dealt in accordance to the rights given by the constitution, provisions in the Scheduled Castes and the Scheduled Tribes (Prevention of Atrocities) Act and landmark judgments given by the courts. It is the only solution. Is it possible to safeguard the interests of tribals when land acquisition in tribal belts is happening at a fast pace? There is a special mention about the rights of the tribals and minorities in the constitution. The fifth schedule of the constitution prohibits the transfer of tribal land, while the sixth schedule contains provisions relating to administration in these areas. Currently, both these powerful constitutional rights are in a weak state. It is exploited by corporates. We want the fifth and the sixth schedules to be strengthened. While I was the member of the parliamentary committee, I gave a suggestion of retaining the property rights of the tribals even after the land is taken for mining purpose. Retain the land in the name of the tribal to whom it belongs to even after the corporation acquires it. The tribal should be a shareholder and receive money each month. After the mining work is over, the land should be returned to him. How do you plan to address the ongoing problems in Jharkhand? We will inquire about all amendments made in the Chotanagpur Tenancy Act, 1908, and the Santhal Pargana Tenancy Act, 1949. There are several programmes run by the centre and the state government for the welfare of the tribals. Why are the schemes for tribals failing? Unfortunately, these programmes fail because there is no proper monitoring. For example, under the tribal sub plan, money is allocated for welfare of tribals but it lacks monitoring. My focus will be to check how and where this money is utilised. It is important to get a clear picture of what has happened so far, so that we could address failures and loopholes in these schemes. Second, tribals are not getting their reasonable share in government jobs. We have STs who are educated, but are not getting jobs despite reservation. We will check rosters of public offices. There are complaints of use of fake certificates to acquire jobs reserved under the ST category. Every state has a high-powered committee to keep a check on these activities. NCST is a recommendatory body. Do you think the commission is powerful enough to build pressure on the state and the central governments? Prime minister Narendra Modi has expressed his interest in eradicating social disability and economic backwardness in tribal regions. He is inclined towards strengthening STs. Modi’s vision is my inspiration now. As we know NCST is a quasi-judicial body, still it has powers of a civil court and can penalise violators. The strength of the commission should not be assessed on the basis of paperwork. Instead it should be reflected in the work carried out on the ground. As per the information I have received so far, the commission should have a police officer of the IG or DIG rank. This post is currently vacant. We will try to fill this at the earliest. Can we expect the commission to be in full swing in the coming time? There is a saying ‘Asha se aakash’ (From hopes to sky). We are hoping to coordinate with the state governments to stop atrocities on tribal population. Strengthening STs is a challenging task, but I have devoted my life for the cause. In the 1970s, when I first stood up against illegal liquor shops in Chhattisgarh [which was then a part of Madhya Pradesh], I had to go through a lot. To prove that life is possible without alcohol, I had to quit taking salt in my food. Since September 23, 1970, I haven’t taken salt. You have to sacrifice something to be an example.